The TX1 does not feature a CAN bus (yet). So the J200 has 2 SPI to CAN converters each. It uses the Microchip MCP2515T. The CAN of both TX1 are connected together so that the TX1s could communicate via CAN. CAN2 is also connected to the openGear mid plane. CAN 1 and CAN 2 may connect to an external CAN bus via the PicoBlade connectors. They are internally terminated. They can supply up to 400mA of 5V power to external CAN devices. In the picture above the 1000B-T Ethernet add-on module is shown. It plugs into the network extension connector on the left and provides 2 RJ45 connectors for connection to Gigabit Ethernet. Optionally the 2 RJ45 connectors may not be populated and the 2 9 pin PicoBlade connectors may be used to connect to externally mounted RJ45 connectors. Ross has developed a standard 19″ 2RU chassis for the installation of up to 10 double height or 20 single height cards. 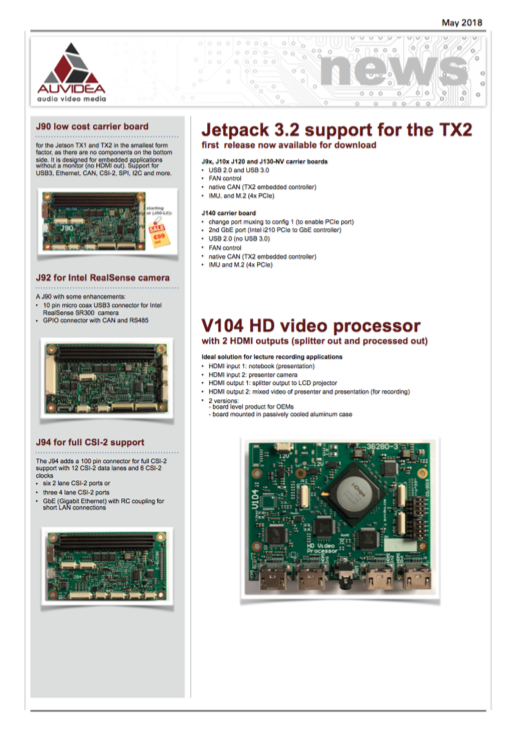 With the addition of a special openGear add-on module the J200 with 2 TX1 compute modules may be inserted in the openGear chassis. This adds a very high performance compute platform to openGear. As the J200 occupies a double height slot, up to 10 of the J200 may be installed in this chassis. So up to 20 TX1s in 2RU. This is the theoretical limit. It will be tested as soon as the J200 and the accompanying openGear add-on module will become available. The openGear add-on module is installed in the network extension connector on the left. It features 1000B-T to 1000B-X conversion to connect to the Gigabit Ethernet on the mid plane of the openGear chassis. Pricing has not been set yet. The price for the modules for beta customers is €999 net plus VAT. This includes the 38195 and 38196. If you are interested to become a beta customer please let us know.